We’d love your help. Let us know what’s wrong with this preview of Revolution in World Missions by K.P. Yohannan. To ask other readers questions about Revolution in World Missions, please sign up. I enjoyed the reading about the history and locations where they brought their books. K.P. mentions the Sikhs in Northern India, however, little is said of the Hindus and the fact that their religion goes back Millennia and is ingrained not only in their way of life, at the time, but arrangement of marriages etc. Does he address this in one of his other books? Virginia Stone Read the summary of another one of his books - "No Longer a Slumdog". This book shakes all of your cultural foundations. Honestly written, KP's story of experiencing America for the first time opens our eyes... it challenged me to pursue real change. The stories in this book are astounding and heartbreaking. Reading this, you know God is working in crazy ways, and that satan is real and trying to wreck people. The power of God is so evident throughout the stories. K.P Yohannan writes about his first impressions of America during his first trip there and its truly eye opening seeing it from his view. I think he is a bit angry at the blessing of America and acts as if Western Christianity is useless. When in fact, despite any upbringing, poor The stories in this book are astounding and heartbreaking. Reading this, you know God is working in crazy ways, and that satan is real and trying to wreck people. The power of God is so evident throughout the stories. K.P Yohannan writes about his first impressions of America during his first trip there and its truly eye opening seeing it from his view. I think he is a bit angry at the blessing of America and acts as if Western Christianity is useless. When in fact, despite any upbringing, poor or rich, God raises up who he wants, in whatever ways. India has the caste system, extreme poverty, and a more prevalent demonic presence that can been seen or felt. America has luke warm Christians or people who are religious going to church for the sake of tradition, which is a demonic tool as well, but used differently. Two very different places, yet two very open ministry areas to minister in for those who are passionate about the cause of Christ. His attack in Chapter 5 probably does more bad than good in trying to win Americans over. I felt hurt that his image of Christian American's was our large churches, our 'largeness' in body type, our constant watching of TV and news, and even our christian schools and stores was somehow hateful to Asia?? This book really changed my heart. The book began with the wonderful story of the man who started Gospel for Asia. But as it progressed he went in to details about the culture shock he experienced when first coming to America. He opened my eyes to how lucky I am and how often I neglect to think, feel, or live that way. In the second part of the book he also talked about the importance of native missionaries and their important role in bringing the Gospel of Christ to the lost souls in the two-thi This book really changed my heart. The book began with the wonderful story of the man who started Gospel for Asia. But as it progressed he went in to details about the culture shock he experienced when first coming to America. He opened my eyes to how lucky I am and how often I neglect to think, feel, or live that way. Mr. Yohannon makes an excellent case for supporting native missionaries rather than sending missionaries from the West into unreached territories overseas. Not only do the native missionaries cost less, but they already know the language, customs, and culture and are far more attractive to their fellow citizens than foreigners are. This book is also part autobiography that inspires, convicts, and entertains. The only downside is Mr. Yohannon's sales pitches for his own mission agency. I am sure t Mr. Yohannon makes an excellent case for supporting native missionaries rather than sending missionaries from the West into unreached territories overseas. Not only do the native missionaries cost less, but they already know the language, customs, and culture and are far more attractive to their fellow citizens than foreigners are. I found this book very challenging. The main point that the author is trying to make in this book is that the most effective way to reach the lost throughout the world is to utilize indigenous missionaries (aka Indians evangelizing Indians). He makes some very strong points. Indigenous pastors are much less expensive than sending Westerners. The language barrier is difficult and time consuming for Westerners to overcome. There were a couple of things that bothered me. First, he lays into America' I found this book very challenging. The main point that the author is trying to make in this book is that the most effective way to reach the lost throughout the world is to utilize indigenous missionaries (aka Indians evangelizing Indians). He makes some very strong points. Indigenous pastors are much less expensive than sending Westerners. The language barrier is difficult and time consuming for Westerners to overcome. There were a couple of things that bothered me. First, he lays into America's prosperity pretty hard. Instead of taking the gentile approach of appealing to the blessed to also bless, he comes off as disgusted at the amount of stuff we have and our blinking lights. He talks about all the money in big industries and that if we would just take all that money and give it to missions, all of Asia would be evangelized. He fails to recognize that if Americans didn't have the innovation and entrepreneurship to create industries, there would be no prosperity to share at all. Maybe it's just me, but I think he didn't take the high road in that section. Second, he largely misses the point (though he barely acknowledges it at the end of the book) that God calls some people to world missions. And who God calls, God equips. This bothered me a lot, because the indigenous movement makes so much sense. I am one of those people that feels called to missions (hence, I'm in Brazil now as a missionary). I experience the economics of it, and I experience the barriers... but does that mean that I'm not called to missions? For me, this was a valuable book to read, though it left me with unanswered questions. As an American, rather than coming away with a great vision and inspiration for the future, I come away slightly discouraged and not edified or uplifted. I have heard about the "mission effort" in the church since I was a child. I have heard many missionaries speak and read many missionary biographies. KP's story and ministry philosophy is unique. He is the first ministry leader to advocate for strong indigenous/native missions to include oversight and control. For centuries the Western world has been sending missionaries overseas and great things have been accomplished as great sacrifices were made by those who went and sent them. Yet it does se I have heard about the "mission effort" in the church since I was a child. I have heard many missionaries speak and read many missionary biographies. KP's story and ministry philosophy is unique. He is the first ministry leader to advocate for strong indigenous/native missions to include oversight and control. For centuries the Western world has been sending missionaries overseas and great things have been accomplished as great sacrifices were made by those who went and sent them. Yet it does seem as if times are changing and in regions like India and Asia where there is a growing and vibrant church, why wouldn't we work hard to help empower them to do the job that is right in their back yard. This is a new perspective on missions that I was blessed to read and consider. On a personal level, I enjoyed reading about KP's life and upbringing, straddling two worlds and through that receiving a very unique call in God's kingdom, which is his current ministry effort. Who would have thought that we "the American church" needed people sent from God to show us grace and to help us learn how to truly follow Jesus in the midst of all the noise and stuff in our lives. There are various claims circulating about the ministry of GFA and several pending court cases. I am unsure whether these claims are true. If they are, it will be very sad as this is a ministry I have supported and volunteered for over the years. KP came to speak at my church in England and I was so challenged by his message that I ended up in mission work myself. I devoured this book and have read it several times over the years. It came as such a disappointment to hear that the man who wrote a There are various claims circulating about the ministry of GFA and several pending court cases. I am unsure whether these claims are true. If they are, it will be very sad as this is a ministry I have supported and volunteered for over the years. KP came to speak at my church in England and I was so challenged by his message that I ended up in mission work myself. I devoured this book and have read it several times over the years. It came as such a disappointment to hear that the man who wrote a book like this may not be following the simple lifestyle he advocates, in all of his books. This book will challenge, convict and offend. The author lambasts the Western church for its failures but also calls Christians to action. GFA was, at the time, the only organisation promising to send 100% monies to the field and using native workers. This book is a well-written, tactful, passionate, objective presentation of the indigenous missionary movement. It is directed toward Christian Westerners in wealthy democratic nations (Americans, UK, Australia, New Zealand). And above all the book and its author, K.P. Yohannan, present a Biblical, God-centered philosophy of missions and of the Christian life (which things should be inseparable). When I picked up this free book to begin reading, I was fully aware that its purpose is to raise awa This book is a well-written, tactful, passionate, objective presentation of the indigenous missionary movement. It is directed toward Christian Westerners in wealthy democratic nations (Americans, UK, Australia, New Zealand). And above all the book and its author, K.P. Yohannan, present a Biblical, God-centered philosophy of missions and of the Christian life (which things should be inseparable). When I picked up this free book to begin reading, I was fully aware that its purpose is to raise awareness of the ministry of Gospel for Asia, and to increase financial support for its missionaries. As I read the book I was more focused on what is the Biblical basis for missions than anything else. I encourage you to read it all the way to the last page, especially the Q/A section, which clears up those niggling questions we all have. Yohannan makes excellent points in showing the contrast between the Western Christian's world and the Asian (India in particular) world, and why the indigenous missionaries experience much greater success in their Gospel presentation. The attitude of servitude and humility on the part of the indigenous Asian missionaries is humbling and greatly thought-provoking, and soul-stirring. When you finish the book, it is time to listen to the leading of the Holy Spirit in your own heart...what will my response be to this need? I really enjoyed this book. K.P. Yohanan's testimony is amazing. The work God is doing through native Indian missionaries is amazing. One MAJOR caveat: This book can give the impression that Asia does not need white missionaries. I know many people, including myself, came away from the book feeling as if we had no place in the Asian church. But that is a complete misunderstanding of the gospel. Asia needs white missionaries, black missionaries, etc. Just like America needs Korean missionaries and I really enjoyed this book. K.P. Yohanan's testimony is amazing. The work God is doing through native Indian missionaries is amazing. One MAJOR caveat: This book can give the impression that Asia does not need white missionaries. I know many people, including myself, came away from the book feeling as if we had no place in the Asian church. But that is a complete misunderstanding of the gospel. Asia needs white missionaries, black missionaries, etc. Just like America needs Korean missionaries and Indian missionaries. We are an interdependent. We are complementary, not independent. There is always a place for foreign missionaries to correct the native perspective, whether native is the United States or Malawi. This was a book club pick, and I have always read the book club picks, no matter how I felt about them, so the fact that I am tossing this one aside is significant. I tried, I really tried, but this guy's version of Christianity is not for me. He lost me when he basically said that it is ok to let the Third World starve, as long as we save their souls first. Enough said. I have wasted all the time I am going to on this guy. Ths is a MUST read for anyone who wants God's heart for the World! Yohannan is an incredible voice for worldwide evangelization, and for making the changes in missions philosophy of the western church that will help facilitate that goal. The first part of the book is a frightening comparison of the Biblical mandate that God has given us to 'Go unto all the world and preach the gospel to all 'ethnae' (people groups), and the reality of the vast numbers of people groups and individuals who are cu Ths is a MUST read for anyone who wants God's heart for the World! The first part of the book is a frightening comparison of the Biblical mandate that God has given us to 'Go unto all the world and preach the gospel to all 'ethnae' (people groups), and the reality of the vast numbers of people groups and individuals who are currently totally or almost totally unevangelized throughout the world. Within his own country of India, Yohannan describes that there are thousands of different languages, and only a fraction of them have the Bible translated into them. And India is soon to be the most populated country in the world. Yohannan then gets to the main point of this prophetic word God has given him. That the future of global evangelization is no longer served by the 18th century philosophy of the white missionary trekking to distant jungles to bring the dark heathen to the light. God has revealed that the indigenous missionary movement, that is annointed, called, believers from within the many nations where the masses of the lost are located, is the most effective tool for bringing to pass the vision that John had in Revelation of peoples from every nation('ethnae' - people group), tribe and toungue gathered before the throne of the Lamb worshipping Him. 1. That the sending of western missionaries is at least 10 times more expensive, than eqquipping indiginous missionaries with the exact resources they need to reach the most unreached areas of the world. 2. That westerners in general, and western Christian in particuar are mistrusted and even despised in most of the most unreached countries, to the point that they will never be able to reach more than a fraction of the people they are targeting. 3. That the methods of evangelization used by the indiginous ministers are vastly more effective because they do not try filter the gospel first through western culture, and then back into their own culture. The gospel is presented in a way that makes sense to them in their own culture without diluting or confusing the message. (See the Apostle Paul's use of the 'atar to the unknown god' in Athens - and the bok 'Eternity in Their Hearts' by Don Richardson. The role of the western church, according to Yohannan is not in any way diminished by the plan of God, but is merely shifted to one of support through prayer, finances and infrastructure. He goes specifically into the importance of each of these tasks and the way that western missionaries, and missions organizations will always remain vital to goal of global evangelization and discipleship. Imparting a prophetic word that he knows will cause negative reaction in many in the western church, without diluting or compromizing the message itself in order to 'soften the blow' or protect himself or his ministry is a very hard thing to do. Yohannan gives personal testimony of the journey that God brought him along in order to show him that he could neither soften nor dilute the message, but had to give it as he heard it from God. But in spite of the possibilty of offence, Yohannan's humility, in his delivery, give the message even more power and authority. I don't want to criticize Yohannan because the Lord is obviously doing great work through him, but this book was not very well written. It is a short, easy read, but also extremely repetitive with no real conclusions. Thinking back, it seems more like a sales pitch to get money for GFA then a story about anything. I liked the stories of what was actually happening through GFA, but it was a very dry read. 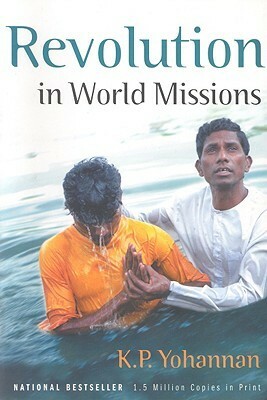 I don't really have a biased opinion of missions, I think it is ridiculous that we do spend s I don't want to criticize Yohannan because the Lord is obviously doing great work through him, but this book was not very well written. It is a short, easy read, but also extremely repetitive with no real conclusions. Thinking back, it seems more like a sales pitch to get money for GFA then a story about anything. I liked the stories of what was actually happening through GFA, but it was a very dry read. I don't really have a biased opinion of missions, I think it is ridiculous that we do spend so much money to send people over there, especially the trips that are more vacations, like going to water parks and tourism, instead of telling people about Jesus. I can't really talk though, because I am so awkward and shy it is not like I am going around telling people either. I also agree that we spend WAY too much on the church buildings, and that has been bothering me for a while now, so I'm glad he called those things out. Recommends it for: Every Christian who has lost sight of what being a "Christ" like Christian is all about. This book is INCREDIBLE! It will give you a different outlook on life. It really brought me back to what being a "Christ" like Christian is all about. KP Yohannan has clearly pinpointed the truths about many American churches. We are indeed a "Sleeping Giant" with a need to deny our flesh, pick up our cross and follow the plans of our God! An interesting, insightful, and thought-provoking book about world missions. There were a few things that I might not quite agree with all the way, or have something to add, but overall, it was a challenging book. Read it if you want to know how God is moving on the worldwide stage and if you are willing to be changed in the process. Don't read it if you wish to stay comfortable with how you looked at the world before you open this book. • K. P. Yohannan. gfa books, a division Gospel for Asia. 212 pages. • Revolution In World Missions. The title told me that a major change within the missionary field was and is occurring. Once I saw the cover, I swear my heart stopped. It told me exactly the type of book I was reading and how it was slightly different than your usual bibliography. • It drew me instantly with the cover: a street road fades into an old dirt road, a huge grassy plain, and leather feeling on the touch of the top of a •	K. P. Yohannan. gfa books, a division Gospel for Asia. 212 pages. •	Revolution In World Missions. The title told me that a major change within the missionary field was and is occurring. Once I saw the cover, I swear my heart stopped. It told me exactly the type of book I was reading and how it was slightly different than your usual bibliography. •	It drew me instantly with the cover: a street road fades into an old dirt road, a huge grassy plain, and leather feeling on the touch of the top of a dirty book. The cover itself made me think about the type of revolution that has to take place in order for a generation to change. It fits extremely well with the book because a lot of it talks about the changes that a man had to undergo in order to do the right missionary work -within himself and within a group. The pictures that are in the book show the real life events that occurred as sort of pieces of evidence. •	This book is a Bibliography that has a genre of Christian Living. I, 50% of the time, read books like this,the other half is usually fictional. This book would be a great fit for those who are searching for answers within one’s soul and mind. •	The main characters are a man named K. P. Yohannan, and a supernatural entity called God. Yohannan is extremely important because he spends his whole life trying to spread the truth and disciple people across the world. He shares how he finds issues and wrong doings, like changing people and leaving them without any one person to hold them accountable, in things that he –himself– is doing. He also shows how he fixes them along the way. The second main character is God. He is the most crucial character in the book because He’s the man behind the scenes. He’s the one that changed K. P. and helped create the events that happened. Without Him there is no story. •	This book is basically about the life of an extremely shy, young boy, whose mother prayed consistently that he might be able to do something for the LORD, who broke out of his shell after a cry out to God. During this revival, he spent eight years of his life sharing the Gospel to those in the subcontinent. He then studied for four years in theology to pastor a church. It creates a huge mind-shift for me every time K. P. Yohannan changed what he did for a living. He grew more and more in his spiritual walk and fixed any bias views that he had in his heart. For example, in chapter seven, it talks about how he almost gave up on believing that the LORD would do something. How he used up his last bit of faith while pouring his heart out to God to help provide food for him and his wife just pained my soul. However, while Yohannan sat numb, a knock on the door came instantly. A few friends, not knowing about the situation, came to bring them 2 weeks’ worth of groceries! It was amazing to read all of his descriptively detailed emotions felt during that hardship! K. P. had such an eternal grip to help those lost that he finally resigned in 1979 from being a pastor. He is now living as a missionary to spread the Gospel around the world.I now want to meet this man before he passes, God forbid so soon. •	The biggest theme in this book wraps around the thematic subjects of patience and hope: “Things come to those who wait.” For example, on page 68, it shows a clear depiction of the theme. “In some way, which I still do not really understand, the trying of our faith works patience and hope into the fabric of our Christian lives. No one, I am convinced, will follow Jesus very long without tribulation. It is His way of demonstrating His presence.” This shows that without patience, there is no way of living a successful life. God allows trials and tribulations so that we can have a better life. Another example can be from the tenth chapter. “‘Be a Christian and get that bigger house and a boat and vacation in the Holy Land.’ But if that were really God’s way, it would put some believers living in anti-Christian and in the Two-Thirds World in a pretty bad light. Their testimonies… like this: “I was happy. I had everything—prestige, recognition, a good job, and a happy wife and children. Then I gave my life to Jesus Christ. Now I am in Siberia, having lost my family, wealth, reputation, job and health. [or] “Here I live, lonely, deserted by friends. I cannot see the face of my wife and dear children. My crime is that I love Jesus.” I believe that this quote hides the theme of patience and hope really well. This quote is saying that you have to learn how to deal with the hardships and sacrifice what you love for something greater and more purposeful. Basically, when you live for Christ, nothing is any easier than those who don’t. The only difference is that with God you can overcome the obstacles with a greater peace and happiness that you've never known. •	Revolution In World Missions had quite a few challenging words, and it made you think a lot. It is also a bit of a time consumer, based on how critically you read it. But I would still advise that you check it out. I especially enjoyed this bibliography because every time I read it, I would be going through something similar and it would shed some light on the situation. As for the author, based on this book alone, I would say he’s such an intellectual man who actually knows what he’s talking about. I would trust his judgment fully.This book is purely amazing. I can honestly say that I'm not sure if I love or hate this book. K. P. Yohannan is founder of Gospel for Asia. In Revolution in World Missions, he shares both the story of his life and his vision for evangelizing the remaining unreached people groups of Asia, particularly in India. The book is well-written, making clear arguments with which the reader may or may not agree. One thing the reader cannot deny, though, is the unbridled passion that Yohannan has for missions, the Gospel, and the unrea I can honestly say that I'm not sure if I love or hate this book. K. P. Yohannan is founder of Gospel for Asia. In Revolution in World Missions, he shares both the story of his life and his vision for evangelizing the remaining unreached people groups of Asia, particularly in India. The book is well-written, making clear arguments with which the reader may or may not agree. One thing the reader cannot deny, though, is the unbridled passion that Yohannan has for missions, the Gospel, and the unreached peoples of the world. Of all the strengths in this book, four stood above them all. First, Yohannan makes a compelling biblical case for Americans to abandon their materialistic worldview and embrace an attitude of sacrifice for world missions. Yohannan pulls no punches when it comes to this subject. In fact, the call for Americans and other westerners to consider the plight of the underfunded mission field is woven in nearly every chapter. This theme is not uncommon today. Writers like Francis Chan and David Platt have sounded the same alarm; yet Yohannan does so in a way that, for whatever reason, was more impactful on my soul than Radical or Crazy Love. Yohannan writes with such raw emotion and his life is so notably a living example of sacrifice that it impacted me in a very real way. In fact, I had to set the book down for a while to sort of "catch my breath." The intensity of my emotions were overwhelming and I needed to step away and process some of what the Lord was doing in my heart. Second, Revolution in World Missions puts the death nail in the coffin of the social gospel - which is no gospel at all! Yohannan demonstrates how the priority of missions should be the proclamation of the gospel, not social care of the impoverished. He shows how the social gospel has been ineffective in the task of evangelizing Asia. He correctly notes that social ministry can be a great tool to proclaim the gospel, but also notes how in most social gospel outreaches, the primary aim is social ministry and the proclamation of the gospel often gets lost in the shuffle. Third, Revolution in World Missions records Yohannan's understanding of the primacy of the church in discipling new believers and preserving fruit. Early on in his ministry he was an itinerant preacher who would return to villages only to discover that those who had converted were no longer following Christ. The Lord helped him realize that establishing churches was the secret to preserving the fruit of the ministry. Fourth, Yohannan takes a bold stance against the word of faith movement and its off-shoot, the prosperity gospel. The church planters in Gospel for Asia live below the poverty line with those they are reaching. They see this as a sign of apostolic faithfulness. They sacrificial spirit inspires me! There are some parts of Revolution in World Missions that concern me as well. For example, K. P. Yohannan often cites times in his life where he is mystically led. I have experienced the leading of the Holy Spirit in my own life, but I am frankly weary of people playing the "God Card." So many times I see people moving in ways that are either explicitly contrary to Scripture or, at least, contrary to the Spirit of Christ, because they are "mystically led." To be honest, I don't see any evidence of Yohannan following the Holy Spirit in an unscriptural way. My fear is that those who fly more fast and loose will view his testimony as empowering them to continue to be crass and unruly as "the Spirit leads them." Another weakness is his seeming disdain for denominational distinctive. I personally think that they only way to do away with denominational distinctives is to become unthinking. I don't think Yohannan would say that; I just don't see any emphasis on doctrine in this book. Finally, I wish he had more updated statistics in this book. Most of them are more than a decade old. I think if the statistics were updates that the book would be even more punchy towards the fat American church. Overall, this is a book that should be read. Think as you read it. Feel free to agree or disagree with Yohannan. I did. But if his goal was to make me think about how to live more sacrificially on mission for Christ, he did it! -Published by Gospel for Asia. 212 pages. -The title "Revolution in World Missions" really caught my attention, given that I've had a massive interest and desire to be a part of missionary work. The title truly grasped the plot of the book. -The fact that the word "Revolution" is in large print on the cover made me stop to think before putting it down and checking out another book. As a follower of Christ, I know the importance of a spiritual revival and revolution in the world. As I continued ex -Published by Gospel for Asia. 212 pages. -The fact that the word "Revolution" is in large print on the cover made me stop to think before putting it down and checking out another book. As a follower of Christ, I know the importance of a spiritual revival and revolution in the world. As I continued examining the cover, I noticed the words "gospel" and "Asia." As previously mentioned, I absolutely love world missions to spread the Gospel of Jesus Christ, and noticing those words on the cover of the book sparked an interest in me. -The book is non-fiction. It is a first-person story about Yohannan's journey to spread the Gospel in third-world countries, mainly his own where there is an unbelievable spiritual emptiness. People who are followers of Christ or interested in religious movements would enjoy reading this book. Even people interested in religious history and the sacrificial things that Christians are doing for their faith nowadays would like the book. -The main people in the book would be Yohannan and God, of course. Yohannan was born into a culture where there was no religious freedom, and yet his mother believed in God and prayed for years that at least one of her sons would do something great for God. It was very risky, but Yohannan gained a supernatural desire as he grew older to change the world for God. He knew that he was meant for more, and he was also very aware of the risks and fatal dangers he would face in doing so. Without God, Yohannan wouldn't have gained the courage to do all that he did. He's witnessed Christian missionaries get stoned to death right before his very eyes, but God in all his glory gave Yohannan the heart of a martyr. It was ultimately the hand of God that moved Yohannan to do all that he did. -This story is, as I've mentioned before, about a young man born into a culture that detested Christianity. Yohannan had a calling to be a missionary for God, and with that calling, he knew that he had to step out of his comfort zone in order to change the world for the better. He tells his story, everything from the way he woke up one morning and saw things completely different as God had given him supernatural compassion for the people in his country to his travels to America and how being in America stirred up all sorts of emotions in him such as anger, disbelief, fear, and confusion. He went on to become a pastor in America, and he then thought that he had finally reached what God had called him to do. Unexpectedly, however, God told him that he needed to return to Asia, given that Asia was the place God wanted Yohannan to change for Him. It's an intense, touching story of a determined man willing to give up everything, even his life, for the eternal glory of God. -A theme that I found throughout the book was that you need to stand up for what you believe in no matter the cost. Yohannan was perfectly aware that he was putting his life on the line. At any point in time, he could have died. Yohannan is very admirable for everything that he did. Another theme that really stuck out to me was that when you step out of your comfort zone to stand up for God, you WILL be protected. It is no coincidence that Yohannan is still alive today and able to tell his story. He could have just as well died, as many missionaries did in Asia and who are dying right now in other non-Christian countries around the world. Whatever you do, this book has taught me, do with all your heart. Whatever happens, it WILL be worth it. I loved the first 100 pages of this book. The author should have stopped there. The first half of this 200 page is the author's story of how he got involved in missions work and eventually founded Gospel for Asia. I could not put the book down at this point. It read like a novel. And knowing it had all really happened made it even harder to put down! The second half is a whole marketing ploy for his organization. He goes through cycles of talking about how awesome national missionaries are, to h I loved the first 100 pages of this book. The author should have stopped there. The first half of this 200 page is the author's story of how he got involved in missions work and eventually founded Gospel for Asia. I could not put the book down at this point. It read like a novel. And knowing it had all really happened made it even harder to put down! The second half is a whole marketing ploy for his organization. He goes through cycles of talking about how awesome national missionaries are, to how terrible western missionaries are, to how western missionaries were good about 100 years ago (just so he doesn't completely offend his western audience), to how his organization is super awesome because they support national missionaries in Asia. Only a couple times did he even mention Africa and South America and how national missionaries are good there too because his main focus was about where HIS organization is based and how you can support HIS organization. The thing that bothered me the most was when he went on and on about how the job of westerners is to give their money to help his organization and that that is their only job. The worst part of this was his story about how some day, when you're in heaven, you'll be thanked by the people your money helped reach. Like I'm really gonna care once I'm in heaven. And are they really gonna care at that point? No. Because in the end it was Jesus who saved all of us anyway and we'll all be too busy praising Him to care about "who saved who." That story was just stupid. I honestly skimmed through the next couple chapters after that that contained similar material. Speaking of "similar material" the whole book was similar material. The book could easily have been half the length and still got the same point across (Did I already say that? His technique must be rubbing off on me). In fact after just hearing his story of how God worked in his life and eventually led him to found Gospel for Asia made me ready to give to him. But after he marketed his organization to me and went on and on about the same crap over and over I didn't want to give anymore. After all, as the person who gave me the book said, "the gospel is a story that needs to be told. Therefore tell your story about God." Which is what the author did... in the first 100 pages. To the author's credit, though, he did make some good points about national missionaries. Points such as how national missionaries understand the culture they are preaching to and are cheaper to support but, again, these points could have easily been made in half the length. This is a great book by Brother K.P. to advocate for giving missionary funds to native missionaries. Their sponsorship is very similar to sponsoring a child, where they would send you a picture of the native missionary & his/her testimony. Reading this book will make you feel guilty about the native missionaries' journeys, so don't read it if you're the type of person who has a hard time saying no. I received this free book by chance on the Internet. I think this book itself is worth a donat This is a great book by Brother K.P. to advocate for giving missionary funds to native missionaries. Their sponsorship is very similar to sponsoring a child, where they would send you a picture of the native missionary & his/her testimony. Reading this book will make you feel guilty about the native missionaries' journeys, so don't read it if you're the type of person who has a hard time saying no. I received this free book by chance on the Internet. I think this book itself is worth a donation, so I donated by buying the GFA Mini World Map & Asian Christian CD. This book is really excellent in reminding me what is the point of missionary work. I was a little confused after going on a Taiwan mission trip, because it was all about forming relationship instead of doing work. However, Brother K.P. emphasizes that the whole point of mission work is forming relationships with the lost and healing their souls. We are not social workers, so we are not out there only for helping the poor. Jesus does command us to care for the least, but the most immediately need is spiritual food instead of only materially. Favorite Quote: "The Great Commission reveals the reason God has left us here in this world, the main activity of the Church until Jesus returns as the King of kings to gather us to Himself. He desires us to go everywhere proclaiming the love of God to a lost world. Exercising His authority and demonstrating His power, we are to preach the Gospel, make disciples, baptize and teach people to obey all the commands of Christ. This task involves more than handing out leaflets, holding street meetings or showing compassionate love to the sick and hungry, although these may be involved. But the Lord wants us to continue as his agents to redeem and transform the lives of people. Disciple-making, as Jesus defined it, obviously involves the long-term process of planting local churches. I grieve as i write this review. This is a great book on the origins of Gospel For Asia, and it's founder's vision. However, it is a case of do as i say, not as i do. In recent years, GFA has been highlighted for numerous corrupt practices in financial and spiritual matters (a quick google search will reveal what I am talking about). It is really a shame because KP's message is vital for the church, he challenges western christians to rethink the great commission, and he does it well. I find it a I grieve as i write this review. This is a great book on the origins of Gospel For Asia, and it's founder's vision. However, it is a case of do as i say, not as i do. In recent years, GFA has been highlighted for numerous corrupt practices in financial and spiritual matters (a quick google search will reveal what I am talking about). It is really a shame because KP's message is vital for the church, he challenges western christians to rethink the great commission, and he does it well. I find it a great tragedy that the humble beginnings of this ministry have given way to the trappings and corruption that comes with position and power, especially in christians. It is something we see repeatedly in christian leaders, and a lesson to us all. He believed, as many before him have, that if God was doing anything in the world, He would do it through him. Unfortunately now the same thing can be said of KP himself. All through the book, he faithfully decries the social gospel, poor stewardship of funds spent on missions, sins in the life of church elders etc. These three are the most powerful allegations now being made against KP in his holding of thousands of acres of land in India and the disparity in financial reporting in US and India; the opening of a top-notch hospital in an affluent part of the country for medical tourism; and the ring-kissing incident (in 2003 KP left his earlier evangelical roots to become a Metropolitan Bishop in the Syrian Orthodox tradition, and videos have emerged of ordinands being required to kiss his ring upon their ordination). I'm struggling to write a review of this book. If I could give this 3.5 stars, I would. I thought Yohannan touched on excellent points, but I'm unsure about the overall tone of the book in the way he directs the Western church to act. I'm not deeply knowledgable about the missions field and the struggles faced, and I don't know a lot about the landscape of the Asian mission field. I can tell that K.P. Yohannan loves the Lord and has been called to serve his people. I found his perspective helpfu I'm struggling to write a review of this book. If I could give this 3.5 stars, I would. I thought Yohannan touched on excellent points, but I'm unsure about the overall tone of the book in the way he directs the Western church to act. I'm not deeply knowledgable about the missions field and the struggles faced, and I don't know a lot about the landscape of the Asian mission field. I can tell that K.P. Yohannan loves the Lord and has been called to serve his people. I found his perspective helpful on indigenous people being much more effective in sharing the gospel with their own people. He discusses excellent points about neoclassicalism and its harmfulness in light of spreading the gospel. Although the Spirit may be leading him in one direction, I don't know if I agree with his assessment of everyone else's calling. I'm probably summing this up too cynically, but basically, he tells Westerners to "stay home" and just give your money to local people to prostelatize. In the beginning of the book, he condemns Westerners for living too extravagantly (perhaps a valid point), but then he doesn't give much more of a challenge other than "give my organization money" [again, my own cynical viewpoint]. He is frustrated with how Westerners come into foreign countries with bad programs that are unable to reach the indigenous people [again, perhaps valid point], but I don't feel as though all Westerners should "stay home" and not "go" as the Lord commands. What would happen if Paul didn't "go" on missions to other people groups? After stumbling upon a banner on a Christian website advertising this book for free, claiming that this book 'would change you life,' I decided to order the book. Needless to say, this book definitely did change my perspective on a LOT of things. Brother K.P. exhorts Americans to return to the gospel call and the great commission, vowing that this age is not the age of the Western missionaries going to the East, but rather, national or indigenous missionaries - who can be well equipped and train After stumbling upon a banner on a Christian website advertising this book for free, claiming that this book 'would change you life,' I decided to order the book. Needless to say, this book definitely did change my perspective on a LOT of things. Brother K.P. exhorts Americans to return to the gospel call and the great commission, vowing that this age is not the age of the Western missionaries going to the East, but rather, national or indigenous missionaries - who can be well equipped and trained - going to their own people. This saves an exorbitant amount of money, and is being more tactful with the funds of the Church. K.P. puts out the statistics bare, and the realities of them are startling. We as Americans are greedy, and do not put our money where our mouth is - raiding money for an organization, and then spending more money on the pasta banquet after the fundraiser on ourselves! After reading this book, I became involved in GFA immediately, and thenceforth starting supporting a national missionary in India, and a Bridge of Hope child in India as well. I also had the opportunity later on to travel to GFA headquarters and do an internship down in their writing department for a couple months. I pray it changes your life - and pushes you to action. KP Yohannan gives a vivid and powerful look at current state of south Asia and how Western Christians, in the USA specifically, can follow God by assisting missions there. As an Indian who has also lived in America, he gives a much-needed perspective on the Western Church in a relatable manner. I would definitely recommend this to all Christians in the US, as I think this perspective is not heard often (if at all). As a note, Yohannan focuses specifically on the 10/40 window (mainly India). Whil KP Yohannan gives a vivid and powerful look at current state of south Asia and how Western Christians, in the USA specifically, can follow God by assisting missions there. As an Indian who has also lived in America, he gives a much-needed perspective on the Western Church in a relatable manner. I would definitely recommend this to all Christians in the US, as I think this perspective is not heard often (if at all). As a note, Yohannan focuses specifically on the 10/40 window (mainly India). While I think this focus is strategic and helpful, I am wary to focus on one region at the loss of other people groups in the world. That said, I definitely think it is possible to assist missions both in the 10/40 window and everywhere else, so it's not really harmful that he focuses on it. It makes sense that he would focus on the region he is most involved with and knows the most about. Dr. KP Yohannan has been crisscrossing the globe for the past 40 years, challenging the Body of Christ to discipleship. His call to a radical lifestyle—with an all-out commitment to Jesus—has left its impact on nearly every continent. To the Church caught up by the tidal waves of compromise and self-preservation, Yohannan’s life message is a fresh word to this generation and yet as timeless as the Dr. KP Yohannan has been crisscrossing the globe for the past 40 years, challenging the Body of Christ to discipleship. His call to a radical lifestyle—with an all-out commitment to Jesus—has left its impact on nearly every continent. To the Church caught up by the tidal waves of compromise and self-preservation, Yohannan’s life message is a fresh word to this generation and yet as timeless as the scriptural mandate itself. Yohannan is the founder and director of Gospel for Asia (GFA), a Christian mission organization deeply committed to seeing communities transformed through the love of Christ demonstrated in word and deed. He is also the metropolitan bishop of Believers Church , an indigenous church in South Asia.